I wish Sony would make an off-camera cord for the Active Interface Shoe (AIS) that comes on its latest line of camcorders. AIS is a proprietary 16-pin interface that controls microphones, lights, and potentially other accessories. I have been using the Sony ECM-HGZ1 Gun Zoom Microphone recently and an off-camera cord would help me place the microphone remotely. Or if I want to shoot the frame in diagonal fashion, I would still be able to point the microphone to the left or right of the camcorder. Canon has provided the Off Camera Shoe Cord 2 for years; the Canon EOS cameras also utilize a proprietary hot shoe for advanced operations. This extension cord allows you to place Canon EOS flashes remotely from the Canon EOS camera and still allows the camera to utilize TTL and E-TTL. I wish Sony would do the same. 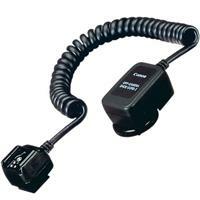 Currently, I do not see an off-camera extension cord in the accessories list for Sony Handycams. Absolutely. I plan on using my DCR-DVD403 with a remote, helmet-mounted camera and would like to mount the surround-sound microphone somewhere where it can be usefull for picking up the sounds I want. That would allow me to keep the camera in a safe place and use the RMVD1 remote control to operate the camera while it's safe from dust and rain. Guess I need to verify that the remote will work with it too. Sony, please make and extension cable. Six feet would do nicely. Thank You. I agree, have asked sony but they just replied that my camera is not professional only higher consumer end.